STORY: The Himalayan states of northern India, Jammu and Kashmir and Himachal Pradesh received the season’s first snowfall on Friday (November 02). Tourists were seen enjoying the snowfall, while playing in the snow in Jammu and Kashmir’s Pahalgam town whole-heartedly. 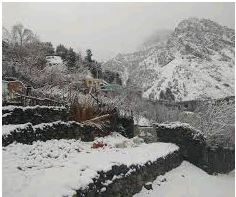 A tourist, Prakash said the snowfall added to the beauty of the valley. Apart from Pahalgam, heavy snowfall was seen in popular hill station of Manali and regions around it. Snowfall in Jammu and Kashmir and Himachal Pradesh has a direct impact on temperatures in lower northern states of Punjab, Haryana, Uttar Pradesh and Indian capital New Delhi. South Asia’s winters are not as cold as other regions such as North America, but people here are hit harder for want of facilities.